It finally happened. I was dreading this day. Speckly is dead. For those who didn’t have the pleasure of meeting her while she was alive, I should explain that Speckly was a Speckled Sussex hen. That’s right, a chicken. A charming, mottled brown and white feathered hen with an affinity for grasshoppers and Japanese beetles. And at 5 years old, she was a quintessential old biddy. Years ago, when Dan and I decided to let the kids raise a flock of laying hens, we never could have anticipated the antics and attachments that would follow. We’ve combated carnivorous creatures from foxes to raccoons. We’ve encountered swooping owls and sharp-eyed hawks. We’ve had rowdy roosters that loved the children but would have gladly eaten me for lunch. We’ve had Houdini hens who kept us devising ever more elaborate systems of cooping and containment. We’ve had the high drama of nursing ailing chickens back to good health, one medicine dropper at a time. And we’ve had fun. Lots of it. We’ve had the pleasure of pampering the “ladies” with cool bubble baths on hot summer days, the thrill of treating the flock to cake and ice cream on high feast days, the joy of giving hens rides in sleds, wagons, and bicycle baskets, and the excitement of hatching baby chicks from eggs and watching them grow … into a new generation of raucous roosters and happy hens. The coop has seen many birds come and go through the years, but none were as important to my oldest daughter as her beloved pet Speckly. Speckly was Kateri’s very first pet. The first animal she called her own and named all by herself. The first animal she loved. Of course we knew this day was coming. When the kids called to me this afternoon with shouts about the hen’s demise, I dreaded the task that lay ahead. I walked to the coop in sober silence, opened the door to a nest box, and found the old bird. Her feathers were ruffled and dirty. Her eyes were closed. When I lifted her into a bag, her body was stiff and heavy. As I carried the hen across our field, several children followed at my heels. We stopped at an appropriate gravesite and I cut into the soft earth with a shovel. Dust to dust. This was just a chicken, I thought to myself as I dug. Just a chicken. But one look at my daughter’s swollen eyes told me there was more to it than that. Worse than any pain we might experience ourselves are the sorrows we parents must watch our children suffer. We want to protect these small souls. And yet we want them to love — to embrace every good thing with all their tiny hearts — and to love means to risk the pain of loss. All were quiet as I turned over the soil. I paused and let Eamon help with the digging while somber Stephen stood alongside, his eyes squinting in the late day sun. When the burial was complete, I suggested a prayer. “Thank you God,” I began. And then what I wanted to say was: Thank you for the foretaste of heavenly joy you give us through even your smallest creatures. Thank you for helping us to understand that to love means to risk getting hurt, but that it’s worth loving anyway. Thank you for the gift of free will, so that we might choose to love you, a choice that will never cause us pain or sorrow. Thank you for the reminder that we all must die one day and that we should live this life with the next in mind. Thank you for the gift of eternal life, for loving us unworthy humans so perfectly that you were willing to die on a cross in order to win us victory over pain, death, and sin forever. But I choked on those words. I couldn’t say them. And yet, somehow, as my children’s small hands pressed the soil down upon that grave, as they fixed a handmade cross of sticks and string upon that mound of fresh earth, I think they understood these words as clearly as if I had said them. Sometimes the most important lessons we learn are ones that go unspoken. “Thank you, God,” was all I managed to say. So sorry for your family. Yes, even Speckly, though a chicken was part of your family. It reminds me St. Francis and how he treasured even the smallest creatures of God. 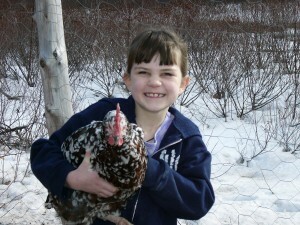 I’m contemplating about getting chickens myself in N.H. We finally have a home in Center Harbor. Right now we go there twice a year(coming from Miami) and stories like this and your beautiful prayer makes me realized that I should not be afraid. Thank you for sharing. God Bless!